This is my personal blog about role-playing games. I've played lots of games over the years, but these days I mainly play Dungeons & Dragons. Specifically, 4LBB — the original D&D box set + the Greyhawk supplement. 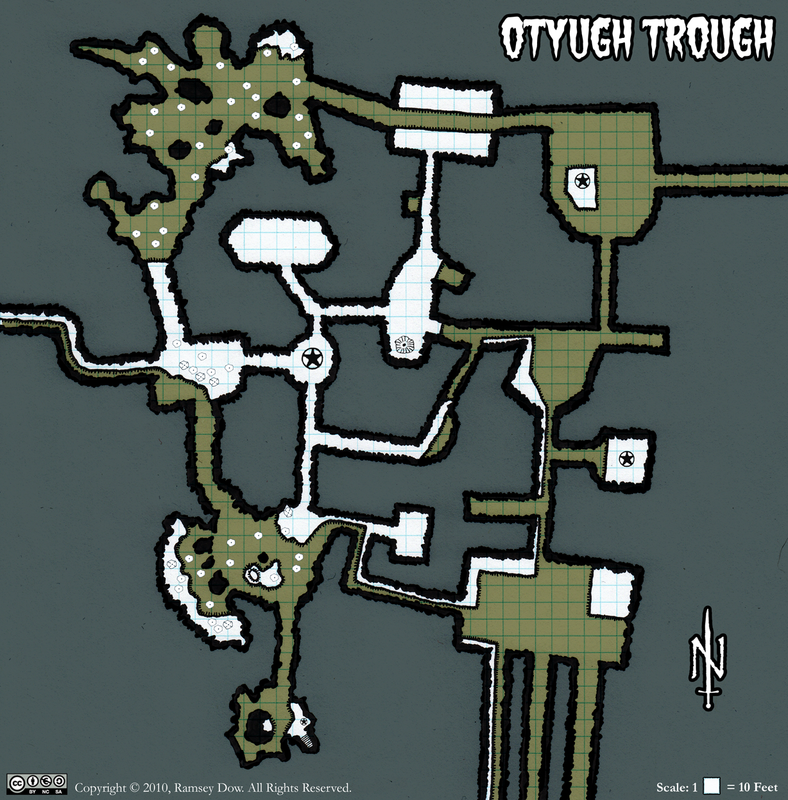 On this blog you will find me sharing maps I've drawn, writing about D&D rules, analyzing various subjects, and BS'ing about RPGs in general. This blog is about fun: nothing commercial and nothing serious. This is my final take on the Otyugh Trough. I like this version the best. I've totally lost the contemporary "over-Photoshopped" look, accentuated the hand drawn nature, and simplified visual interpretation. The muck is easy to see, there are no grid lines where you don't need them, etc. At this point I am done with this subject, but I will continue to experiment with this style. The Fine Print: I am sharing this map under a Creative Commons Attribution-Noncommercial-Share Alike license. If you follow that link you will be able to read about the conditions that apply to this work. In a nutshell: (a) you can't use it commercially, (b) you must attribute it to me, and (c) you must share any derivative works that you create. I like it. Sewer maps are pretty cool overall, especially if they're not just the "hey go kill some rats in the sewer" quest. Not that there's anything wrong with that, mind you. I would agree that I like this version the best. I appreciate that it's not completely quadratic or standard passageway widths, etc. This works well for me (and it IS all about me ;-) ). The grey fill provides a good neutral background, allowing one to clearly see where the tunnels area and the semi-transparent fill for the muck makes it immediately clear where there are ledges and where it's time for boots. A good balance of art and utility. Now I REALLY need to find a good place to put this in one of my current campaigns. You can never have too many otyughs. © Copyright 2018, Sickly Purple Death Ray. All rights reserved. Level Titles are Dumb or: I'm a 4th level Thermador?